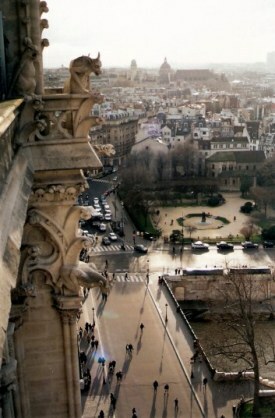 It really is a must to visit Notre Dame Cathedral. Read these pages written before the fire of April 2019, but still go there and pay your respects to a grand lady much loved in the world. To donate to her restoration here is the link to the Dartagnans fund. Dartagnans have long been great preservers of partimonie. 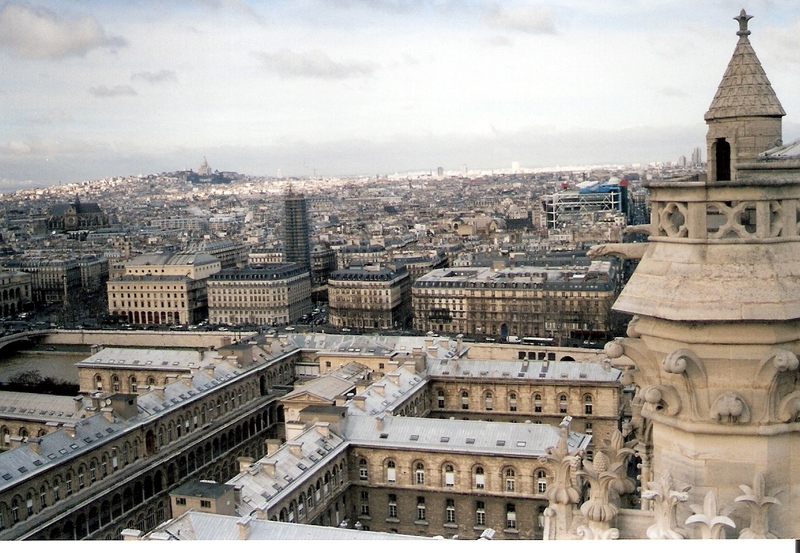 Is it worth the climb of the Notre Dame Tower in Paris? 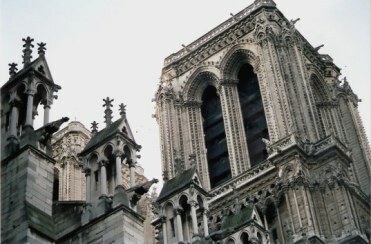 The Notre Dame Cathedral Tower: Is it worth the climb? YES. It WAS worth it, even though it meant climbing 387 steps. Climbing these steps one tends to be asking the Good Lord to help you get to the top without expiring. first we build them, then we pray. This quotation has particular relevance to me, having worked in leading global IT transformations where on occasions, this may well have been the mantra. Before this system was in place there was a human intervention in assigning the number of people allowed to climb the cathedral tower, and it was just as closely monitored. Once on the tower ramparts, I would have liked to have had time to really focus on the timbered house behind this square, or the more simple church in the park beside, but there we had no time to linger. Another group was upon fast on our heels and we were shepherded onwards. Since 2017 you have to book ahead to do so. This can only be done on the day of your visit, but it is only possible to do so from 7:30 in the morning of that day on the app 'Jefile' available from the Google Play Store. If you try to open the app to book earlier than that day it won't respond. Book from a hotel computer, your own laptop or other device, including mobile phone - or from the machine next to the tower entrance at the cathedral. You may choose your time slot for any time after 10am (available in 10 minute slots). Numbers per slot are limited to seven people, so if you have more than that in your group, make appropriate allowances to book multiple slots. 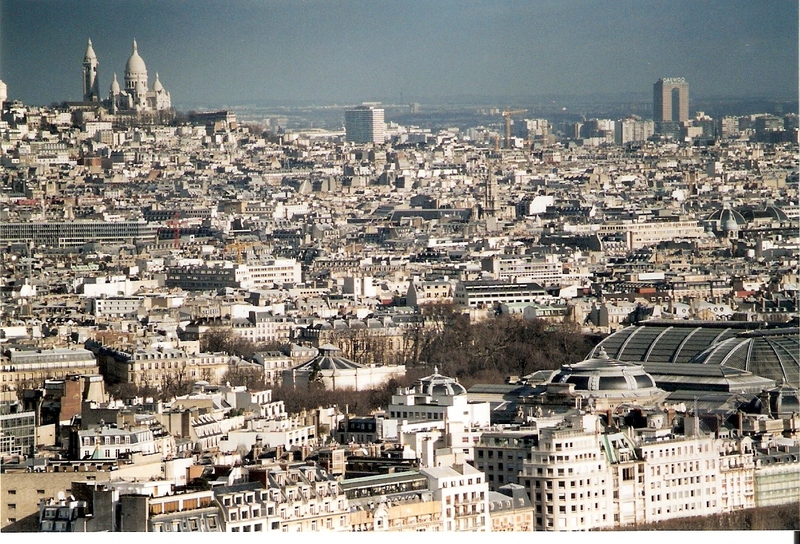 Far in the distance there was the Sacré Coeur, and in the foreground orderly rows of buildings. But a better view was from another section, with the stunning whiteness of the domes of Notre Dame calling me back to their hilltop. In the other direction there is the Eiffel Tower and the January Seine muddiness as it flows past 10 of the 20 arrondisements or districts of the city. The Seine is a busy commercial waterway and brings with it the mud of flooding upstream. 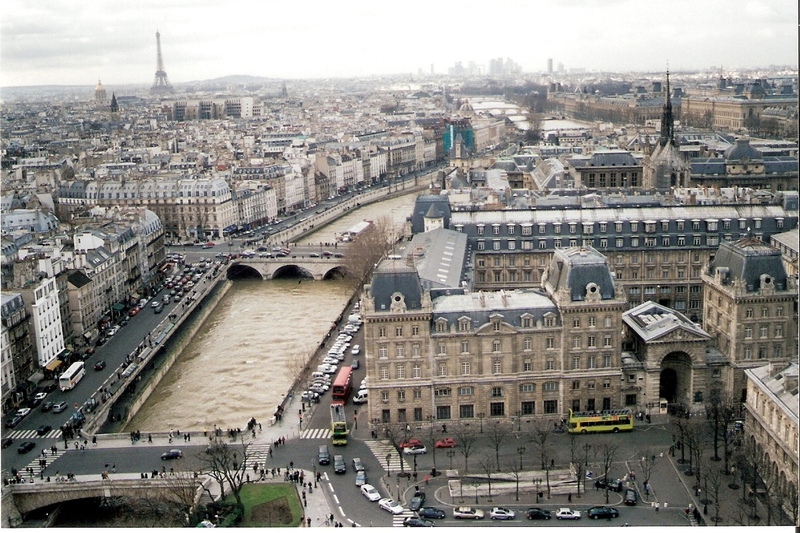 It is not a good thing to think about when half of the water sued in Paris comes from the river - cleaned of course! 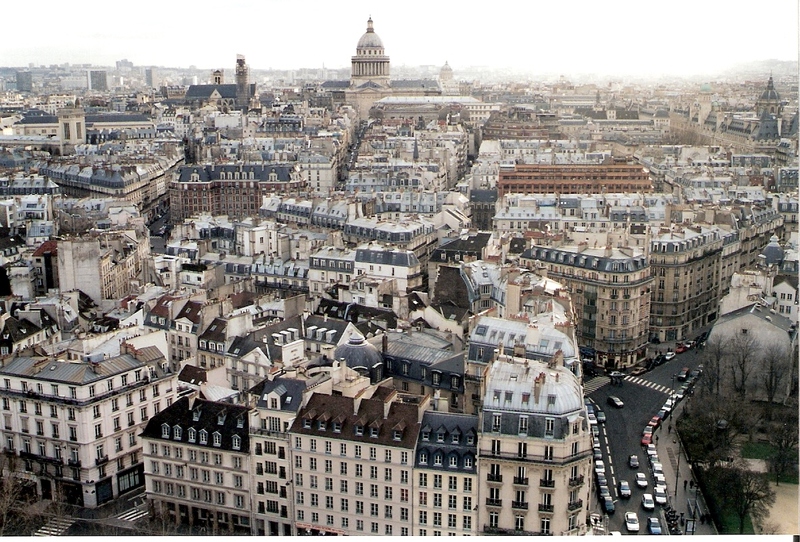 From every direction it is a visual feast reflecting Haussmann’s layout of the city. Georges-Eugène, 1st Baron Haussmann was actually educated as a lawyer, but being a good musician, he concurrently studied music at the Paris Conservatorium of Music. These studies seem a strange background for his future role in civic planning when he became Prefect of the Seine Département. In this capacity, he was undaunted in securing the funding for his massive rebuilding of the boulevards, the twelve grand avenues radiating from the Arc de Triomphe, La Défense and the Grande Arche, and the street facades of Paris (plus the sewers beneath), all started under the reign of Napoleon III. 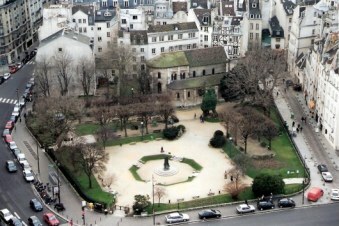 Haussmann eventually ran foul of the government for the vast cost of his massive renovations and his place in history varies according to one’s perspective. Some see him as the person who destroyed medieval Paris, and some see him as the architect of the new, and much treasured city we now enjoy. As you move around the parapets, the vastness of the Paris landscape is laid out for you to find all your favourite landmarks but some of the most famous of all reside right there. As if you needed another incentive, many think the best reason for climbing all those steps is the chance to be ‘up close and personal’ with the gargoyles and other tower guardians. 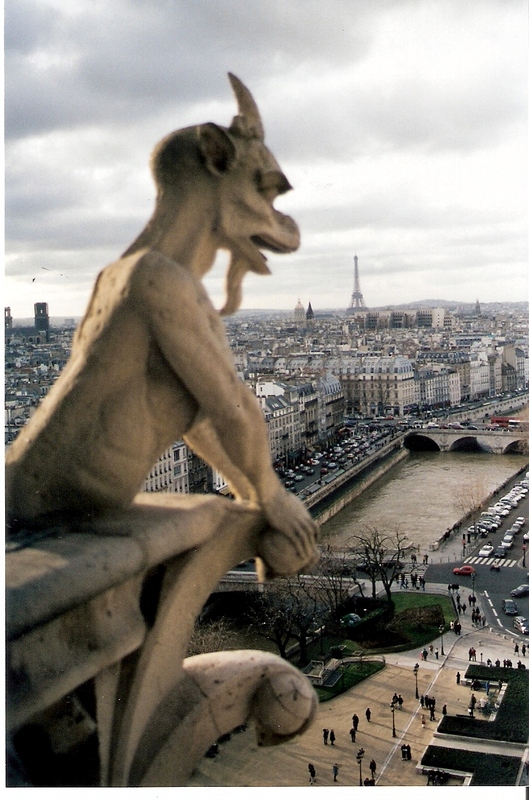 The term 'Gargoyle' comes from the Latin word 'gurgulio' – having the double meaning both of “throat” and the gurgling noise made by water running through a drain pipe. Appropriate for the fact that the purpose of a true gargoyle is to project rain water far from the building through his open mouth. 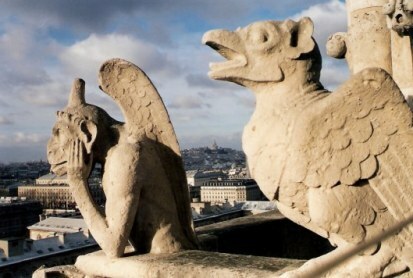 Gothic cathedrals usually required an army of gargoyles to handle the rainwater. The fantastic and often weird creatures that often accompany gargoyles on their lofty perch, but usually not serving irrigation purposes, are appropriately called 'grotesques'. Popular history suggests that they were often malicious caricatures of people with whom either the person commissioning the work, or the artist, had a difference of opinion. Not knowing the personalities their faces were desigbned to parody, all that we recognise now is what a marvellous foil they make for the city of Paris, over which they stare. I am pleased to have made a passing acquaintance with them – grotesque and gargoyle alike. They were on my list of 'Things to Do in Paris' and I found it somehow comforting later, to know that they watched over me as I explored the city, its monuments, and hidden places. To mark the 850th anniversary of this grand old lady of Paris, a new a set of bells for its bell tower have been created. 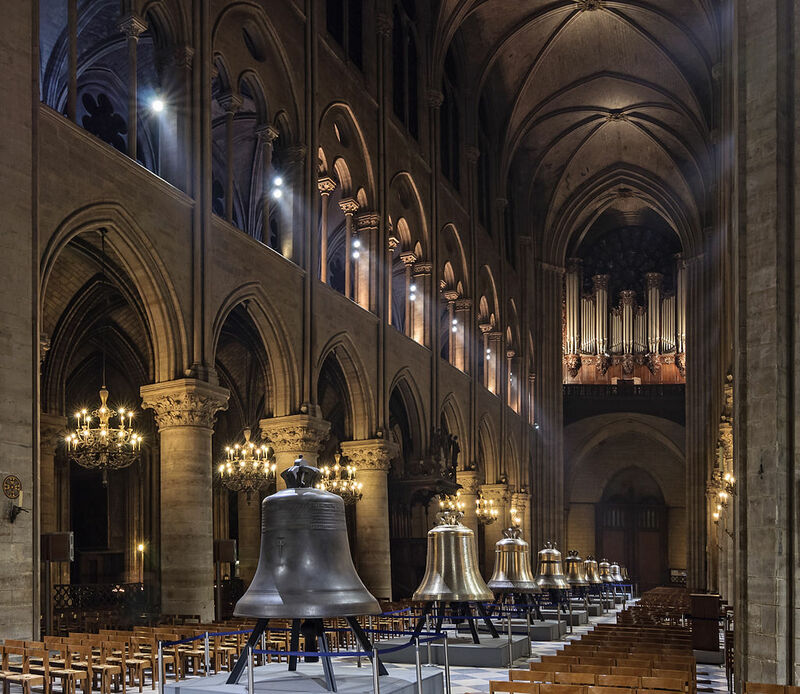 They have been carefully cast to faithfully reproduce the sound of beautifully tuned bells that once rang out from Notre Dam to mark the quarter hours of Paris. The originals were melted down to make cannon balls during the French Revolution. These replacements were cast at the Cornille-Havard Foundry in the small town of Villedieu-les-Poeles, Normandy in the north of France. The process followed medieval techniques: a mixture of 78% copper and 22% tin was melted in a furnace of wood and coal, which was then poured into traditional molds made of clay, horse droppings and goat hair. Those fortunate enough to be in Paris acoud join residentes to meet the bells before they were hung - a rare, and historic privilege. They will join the only surviver of the destruction during the Revolution, the 'bourdon' or great bell called Emmanuel. Emmanuel once had a partner called Marie, and her replacement, also called Marie, was cast in the Netherlands before being sent to Normandy to be tuned with its colleagues. Emmanuel was rehung by Napoleon and has been the stalwart through ensuing centuries. As we welcome the return of harmony from the bell tower of Notre Dame, we should still treasure the service of all the old friends - those bells that shouldered the burden of ringing out - even discordantly, for so many centuries. Angélique-Françoise, Antoinette-Charlotte, Hyacinthe-Jeanne, and Denise-David were the bells so much derided for their poor quality, and who have met their fate in being melted down for scrap. Named for saints, these old friends nonetheless did the job in the absence of others. We should also celebrate them. 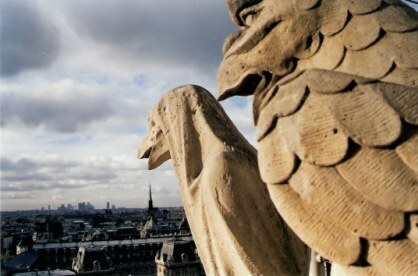 Their new, more sonorous replacements have added companions to share the responsibilities of ringing out above Paris. 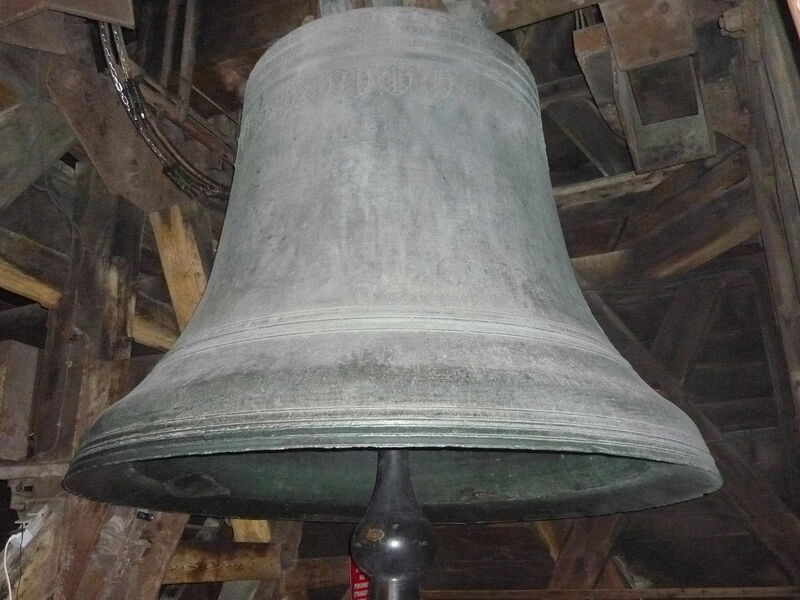 The job that our retiring friends have done alone is now supplemented to make up the original number of ten bells in the Notre Dame bell tower: so now we have Gabriel, Anne Genevieve, Denis, Marcel, Étienne, Benoit-Joseph, Maurice and Jean-Marie (also all named for saints). The old bells may not have made great music. Their sound may have inspired Victor Hugo's Quasimodo, but those departing bells did the job for centuries, and, for centuries it was good enough to mark the quarter hours and ceremonial occasions with a sort of discordant character that had its own peculiar personality. To donate to the restoration of Notre Dame Cathedral, here is the link to the Dartagnans fund.